If absence makes the heart grow fonder, and waiting for real June strawberries makes them sweeter, then surely spring asparagus lives up to its anticipated arrival. When our farmers’ market opened for the season a few days ago, I arrived early at the First Orchards stand for thick purple asparagus and boxes of newly laid pullet eggs—spring treasures in any cook’s book. Now is the time to eat my fill of asparagus. While it lasts, I make it my main green vegetable and select the purple variety if it’s available, always choosing the thickest spears for prime flavor. When it disappears for the season, I’ve had my fill. I’m not tempted by the imported sallow-flavored spears that turn up in supermarkets throughout the year. It’s easy: Just say no to asparagus from Peru or Mexico when Michigan’s bounty promises to return. Asparagus and eggs have long been a perfect match. Whether in a quiche, an omelet, a frittata or a soufflé, they are the ideal pair. When a new clutch of hens begins to lay, their first eggs, called pullet eggs, are treasured for richness and flavor. Young chicks are pickier eaters, seeking out the best bits, and their first miniature eggs taste better than what they will produce later in life. The pullet egg season is brief, so be sure to include them in your shopping whenever you see them. Home again with my basket of asparagus and eggs, one of the best spring treats for brunch, lunch or a dinner first course is quickly cooked asparagus topped with a poached egg. To guild the lily further, add a spoonful of homemade Hollandaise sauce, which is far easier to make than you imagined and your small plate will become ultimate high-end restaurant fare. With a quick wrist and a couple of saucepans, your humble egg and early “sparrow grass” will dazzle royalty. Whisk egg yolks with water and salt in a small stainless or Pyrex bowl that fits over a saucepan of simmering water (or use a double boiler). Cook, whisking constantly over simmering water until mixture is hot (test with your clean pinkie finger), begins to thicken and fluff. Gradually beat in butter 1 tablespoon at a time until mixture mounts like a soft mayonnaise. Season with lemon juice, pepper, chopped chives and fresh tarragon if available. Makes about 2/3 cup. Hold the warm sauce near the stove, over lukewarm water. To prepare the asparagus, cut the spears into 4-inch lengths and diagonally slice the remainder of each stalk. Blanch the spears and slices for 3-4 minutes in boiling, salted water, until just tender. Hold on a warm sheet pan. To poach the eggs, bring a shallow saucepan or skillet with at least 2 inches of water to a boil, season with salt and add a teaspoon of white vinegar. Crack each egg into a small cup. Use a spoon to swirl the simmering water into a whirlpool and slip in the egg. Make another whirlpool and slip in the next egg, etc. Cook each egg about 3 minutes or until the whites are firm and the yolks still soft. Eggs may be poached ahead of time and reheated in a pan of hot water for a couple minutes. Farm-fresh eggs poach beautifully with few shaggy white tails. To plate, place three thick warm asparagus spears in the center of a salad plate and nestle a few slices alongside. 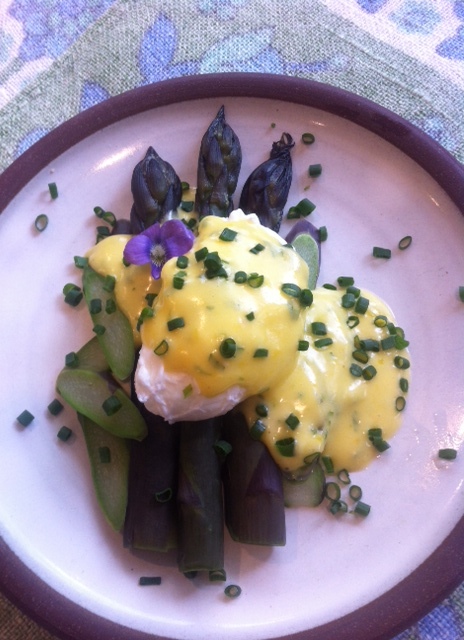 Top the asparagus with a warm poached egg blotted on a tea towel. Spoon over 1-2 tablespoons of Hollandaise sauce. Garnish with chopped chives or parsley. You are currently browsing the Mary Jo's Kitchen blog archives for May, 2015.